Pre-measured Bags of Detergent Here to Stay? Let’s explore all mighty pacs. A few months ago I noticed all mighty pacs at Target and immediately thought the product wasteful, but maybe I was wrong. all mighty pacs are little pre-measured pouches, or pacs, of liquid laundry detergent – one for each load, or two if you have a huge load. The pacs dissolve in the wash when placed in the drum, and are safe for all machines. What’s that film made of? The second time I saw these mighty pacs gazing at me from the shelf I decided to do a bit of research. Just what on earth is that film made of anyhow? According to the all product website, the film is made of polyvinyl. I immediately thought of the yucky polyvinyl chloride, but that couldn’t be it. This film is supposed to be biodegradable. I asked a contact from Sun Products Corporation if the mysterious film is composed of polyvinyl alcohol (PVA). And, indeed, it is. PVA is nontoxic, but I’m not a chemist, so if anyone out there has some interesting facts to throw at me, have at it. We could talk all day about green detergents from companies like Seventh Generation, etc., but what I’m focusing on here is whether this new type of packaging from a very popular company is eco-friendly. The pre-measured pacs can help you avoid laundry detergent overdosing, so they can prevent waste. All detergent contains no phosphates, and is biodegradable. The free and clear version of all detergent contains no dyes or perfumes, and is often recommended for allergy sufferers. According to the manufacturer, mighty pacs use 88 percent less water, and on average 64 percent less plastic packaging than their standard liquid detergent. Sun Products Corporation also says that they can ship 200,000 more wash loads per truck compared to their standard liquid detergent. So, it’s clear that the pacs involve less plastic compared to the detergent bottles, and that the company may save fossil fuels during shipping. What’s not clear is whether the production of the PVA film negates the green benefits noted. Does the pac actually dissolve? Yes. I used the free and clear version in a front-loading he machine, and there was no evidence of a film after the wash. While it was handy to not have to measure and to know exactly how many loads I had left, it did take some time to re-zip the bag, which is supposed to remain closed. You also have to avoid touching the pacs with wet hands, or they may dissolve on you. Will I buy all mighty pacs again? Sigh. I haven’t decided. 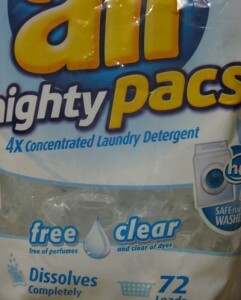 I’d love to get a conversation going on whether these mighty pacs are actually more eco-friendly compared to laundry detergent in a sturdy plastic bottle. 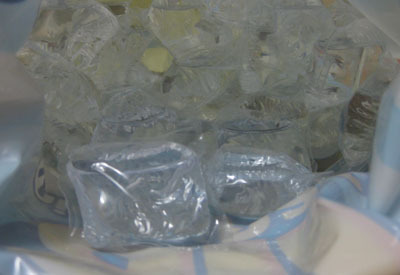 What do you think of pre-measuring laundry detergent in water-soluble pacs?